Allie McMurphy here. So sorry to be late, my writer has gone from Malice to Bermuda for her day job. I know, we all do not feel sorry for her for being late. She promises me she is actually working and not lying on a beach. Do we believe her? 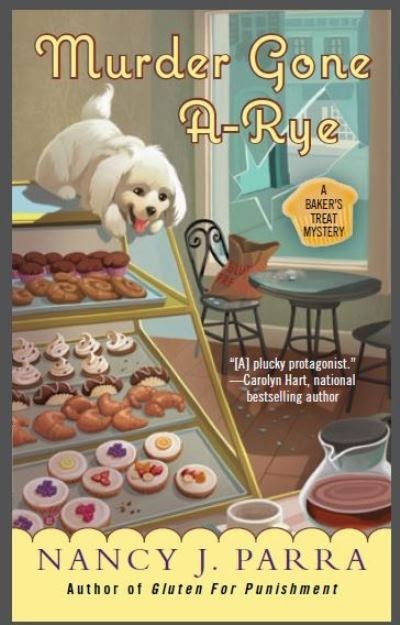 I'm happy to let you know that the second book in the gluten free Baker's Treat Mystery series is out now! Murder Gone a-Rye has Grandma Ruth in serious trouble as the police have found incriminating scooter marks at the scene of the crime. Now, knowing Grandma it could be the police who are in big trouble, but I'm stepping in to keep an eye on the situation. To apologize for being late to post, my writer is giving away a free copy to one lucky comment. So please tell us about your favorite Grandma's wackiest moment to win. 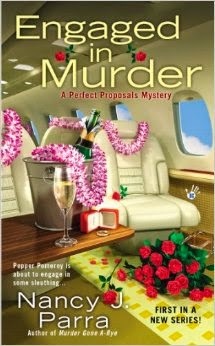 Next up- out in June- is Engaged in Murder the first in the Perfect Proposal mystery series. More in June and this time we hope on time. I wish that I had some moments, I was never lucky enough to have known any of my grandparents. I do have the story my oldest sister told me of how my maternal grandmother had tons of knick knacks around the house and she would hand them one by one to my sister to hold and look at, and examine so she never had the temptation to play with them without my grandmother being there. My grandmother thought it was funny to push out her false teeth at my daughters. One daughter still can't bear to think about it - 45 years later! I am incredibly fortunate to still have my maternal grandmother with me. I think the 'wackiest' thing she ever did was during a visit back when I was in my twenties. I was home for a visit and stopped in to see her around her dinner time. She was cooking a steak which I thought was for my grandfather but, it turns out it was for her little shitzu instead. Meanwhile, she offered me a piece of cheese...and some crackers! I'm not sure but, I think that dog was smirking at me the whole time he was eating that juicy steak - LOL! He was one lucky pup because my Gram is an amazing cook! I honestly can't remember my grandmother doing anything wacky---but oh, boy could she cook!! I also don't think my grandma did anything wacky but I wasn't close to her. She died when I was 9. Another new series, yay! I see leis on the cover so maybe someone goes to Hawaii? My grandmother lived to be 107, When she was younger (103-104), she went to the Senior Center and danced with the young (90s) men. I thought it strange that my grandmother had never made scrambled eggs until I talked her through the process. I don't remember Grandma Minnie doing anything wacky, but I loved her fiercely and used to follow her everywhere.